Some people judge at wine competitions every month, but I only do a few I like. One is Critics Challenge, where a small roster of professional wine writers share tables for two, but don't have to agree on anything. The same wine is poured for both writers, and we can discuss it or not, but whoever gives it the better medal, that's what it gets. I lobbied to sit with Michael Apstein, a Boston-based gastroenterologist and Burgundy lover who doesn't like the taste of fruit in wine. There's no critic I've ever disagreed with more fundamentally on what makes a good wine. So we're the dream team for both wineries and consumers: If it's a good wine, one of us will recognize it. And if neither of us like it, you probably won't either. Having drunk with Michael, what surprised me was how forgiving he is when judging. He gave a lot of golds to wines he personally would not drink. I'm more personal than that. At Critics Challenge, medals come with tasting notes that wineries can use for marketing. I won't have "Gold Medal W. Blake Gray" on a wine I wouldn't drink. We judged 150 wines in 2 days. A few general observations, then onto the wines. * Sauvignon Blancs under $10 were a great category. Combined we gave 4 golds and 4 silvers out of 15 wines. The only category better for us was Mourvedres: just 3 wines and all medals, 2 platinums and a silver. * Worst category for us was Blended Red Bordeaux Rhone Varieties (i.e., Cabernet/Shiraz). We tasted 14 wines, $4-$61, with 8 over $20. I gave no medals; Michael gave a gold because he wanted to reward something. Most tasted like Juicy Juice, not wine. Either Cabernet and Shiraz should not be blended, or those doing so have little respect for their customers. * Surprisingly, the $20-$40 price range, supposedly a market sweet spot, was not good for us. Syrah $20-$40: 11 wines, 1 gold, 1 silver. I'm beginning to think the reason Syrah doesn't sell is because, outside the northern Rhone and Victoria, it just isn't that good. Zinfandel $20-$40: 11 wines, 0 golds, 2 silvers; Michael gave nuthin'. Cabernet Sauvignon $20-$40: 21 wines, 3 golds, 1 silver. In past years I have liked this category as well as more expensive Cabs, and guessed that with price cuts that would be true again, but it was not. We tasted 12 Cabs from $60-$100 and I gave 2 golds, 3 silvers. * Most overrated wine at competitions: Petite Sirah. We tasted 11 wines ($10-$52, 7 over $20) and I gave 1 silver; Apstein gave nuthin'. But another panel got 14 Petite Sirahs and gave 4 platinums, including one that nearly won best red wine of the competition (It really was great, but the other 3 platinums, not so much). I think Petite Sirah does so well with medals because people ask what Michael asked -- "Is this good for what it is?" -- rather than what I asked, "Would I drink this?" I had that conversation with another critic about one of the platinum Petite Sirahs and she said, "I wouldn't drink it, but it's a good wine." I don't think we as critics do anyone any favors by promoting wines like that. * None of the best-in-show wines came from our table; a white described below was closest. My choice for best wine overall came down to two from Mendocino County (which I didn't know at the time), the white and the dessert wine. I hated voting for the dessert wine philosophically because stickies just aren't as useful; I think they're made more for competition and high ratings than for drinking. But man, that was a great dessert wine. We voted by acclamation so I voted for both, and can't begrudge the decision. See the details here. Now, on to the wines I gave gold and platinum. My definition of Platinum is apparently different from other judges'. Each platinum is retasted by all of us as a potential Best in Show for the whole competition. I am stingy with platinums compared to other critics, but that means the platinums I give, I think are really something special. Domaine Laroche Chablis 2010 $28 (A great example of Chablis, yet with good tension and minerality and expanding mouthfeel on the finish) -- This won Best Chardonnay and nearly won white Best in Show, losing by 1 vote if I recall correctly. I liked the white that won a helluva lot, but I voted for this. Impressive that Domaine Laroche did so well with a village-level wine. Michael the Burgundy fiend loved it too. A related point: I believe 2010 was a better vintage in Burgundy than the more-acclaimed '09s, which to me don't have the necessary edge. Sunce Ripken Vineyard Lodi Mourvedre 2010 $30 (good fruit and acidity and savory notes; a well-balanced delight) -- This won best Mourvedre and acquitted my choice with some votes for Best in Show Red. Hurray for Lodi. Big House White California 2011 $10 (pretty floral notes on nose lead to delightful palate of rose petals, lychee and sweet lime) -- Not tasting blind, I usually love this wine. It's perfect for Thanksgiving: cheap, interesting, likable for the whole family. I'm glad I loved it even when I didn't know what it was. Boro Hills Marlborough Sauvignon Blanc 2011 $8 (nicely balances fruit with herbal notes. Long smooth finish) -- The best of a strong category. Unfortunately it's apparently not for sale yet in this country. I believe it's a private label wine of the Fresh & Easy stores. If somebody knows where one can buy it, please let us know in the comments. Domaine Laroche Petit Chablis 2010 $24 (lean body with good lemon fruit and attractive minerality at the end) -- Little brother of my favorite white of the competition. Frank Family Vineyards Napa Valley Chardonnay 2010 $32.50 (rich but not heavy, with Meyer lemon fruit and a good level of toast) -- Easily the best Chardonnay in a bad price category (note: white Burgundy was a different category). Goose Watch Finger Lakes Gewurztraminer Riesling 2011 $15 (strong earthy notes add interest to this complex wine) -- Apstein gave it platinum. Concannon Livermore Valley Reserve Cabernet Sauvignon 2008 $25 (well-made, well balanced with smooth tannins and nice cherry fruit) -- Hurray for Livermore, in a category where exactly half the wines were from Napa Valley. When we tasted these, we didn't know where they were from. Frogtown Cellars Lumpkin County (Georgia) Cabernet Sauvignon 2008 $30 (savory, red plum wine with peppery notes and a saltiness on the finish that makes it cry out for steak) -- Might have been the first Georgia wine I've ever tried. Is that saltiness the Georgia terroir? Sottoriva Antica Valpolicella Ripossa 2008 $10 (complex, interesting nose of dried fruits and flowers with some herbs leads into flavors that open with dried plums and cherries and turn savory on finish) -- Wow! We didn't know the price when we tasted it; it might be the best value red of the whole competition. I was going to do a whole post about it but unfortunately can't find it for sale anywhere online. Sometimes wineries enter competitions hoping for medals that will help them impress distributors into carrying the wine, and that might be the case here. Here are my silvers in that solid under-$10 Sauvignon Blanc category. For under $10, a silver-medal wine is a steal. And while I've never heard of half of these, the other half are very widely available. Barefoot Cellars California Sauvignon Blanc NV $7 (lime fruit and good acidity) -- Apstein gave it gold. Gallo knows what it's doing. 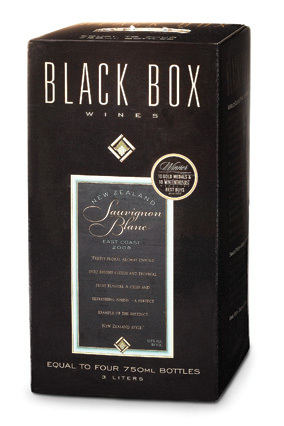 Black Box East Coast New Zealand Sauvignon Blanc 2011 $25/3 litre (equivalent of $6.25/bottle) (ripe tropical fruit) Constellation knows what it's doing too. Gotta like this for summer, a wine that will stay good in your refrigerator after opening for maybe 3 weeks. Fetzer California Sauvignon Blanc 2010 $8 -- (tropical fruit with intriguing pungency that keeps it interesting) -- Apstein gave it gold. Yes, Concha y Toro also knows what it's doing. But seriously, the message here seems to be that if you have to buy a big-production low-price corporate wine, consider Sauvignon Blanc. Pebble Bay Marlborough Sauvignon Blanc 2011 $6 (well-made in popular herbal style) -- Apstein gave it gold. Apparently another Fresh & Easy private label.